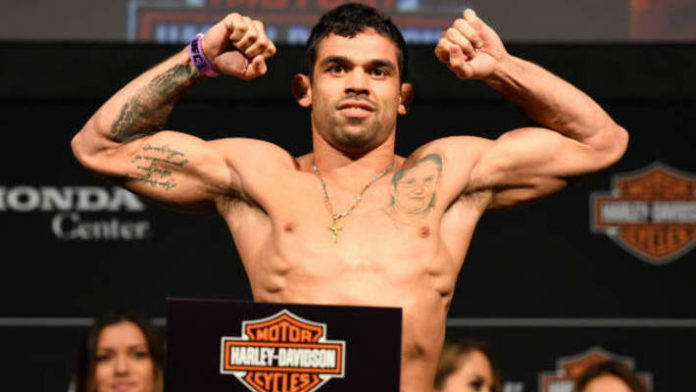 The UFC Sao Paulo weigh-in results are in and Renan Barao is the lone fighter to have missed weight. All 28 fighters on the main card tipped the scales earlier today. Headliners Thiago Santos and Eryk Anders made weight. Santos clocked in at 203.7 pounds, while Anders weighed in at 205.6 pounds. Co-headliners Alex Oliveira and Carlo Pedersoli also weighed in. Oliveira hit the max target of 171 pounds, while Pedersoli reached 170.3 pounds. Light heavyweights Antonio Rogerio Nogueira and Sam Alvey also made weight. Nogueira hit 205.3 pounds and Alvey weighed in just a bit more at 205.6 pounds. When we got to Barao, that’s when the only hiccup of the UFC Sao Paulo weigh-ins occurred. Barao tipped the scales at 141.75 pounds for his bantamweight bout with UFC newcomer Andre Ewell. The limit for the weight class in non-title bouts is 136 pounds. Ewell had no trouble making weight, hitting the 135-pound mark. Barao now has to forfeit 30 percent of his purse.